It’s a proven fact that highly engaged frontline team members create superior experiences for their customers over non-engaged employees. For two examples, think Apple or Zappos. Anyone who has taken a tour of Zappos – or who has visited an Apple store – immediately recognizes a strong company culture. Apple “Geniuses” live and breathe the technology. Zappos employees mix fun and positivity with a little weirdness. Both cultures are impossible to miss. Zappos reports annual agent attrition of 20%, which means only one in five of their contact center agents underperforms to the point of being dismissed, or leaves for another job, in a given year. The rest stick around to build their skills and their career. Likewise, Apple’s retail workers earn above average pay, have good benefits, a company stock purchase plan, and perhaps most desirable – receive discounts on Apple products. Apple surrounds their people with the benefits that matter to them as a part of their culture and employee ecosystem. Think about that for a second. “The customer experience is really a form of marketing.” I couldn’t have said it better myself. 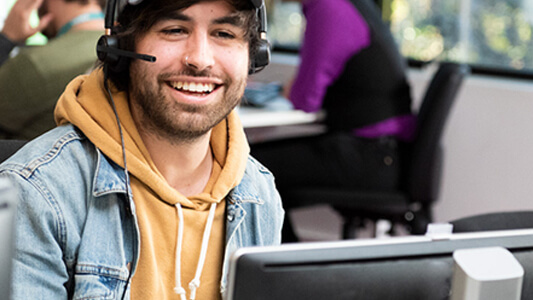 At TELUS International, a BPO with a measured engagement level of 80%, we’ve found that statement to be especially true in highly competitive industries such as financial services, high-tech, and consumer goods. We’ve proven that frontline team member engagement has a direct impact on our clients’ top-line growth. The more a company’s stated values align with its real culture on the ground, the higher it drives measured team member engagement and the lower it pushes attrition. When this equation exists, sustained top-line growth follows. That’s what we call the “Culture Value Chain,” and we’ve seen it proven again and again. A few examples: With a wireless client, fierce competition demanded lower costs while increasing Likelihood to Recommend (L2R). We implemented mechanisms for agents to provide direct customer experience feedback to the client’s retail store operations. Then, we eliminated the handle time metric so agents felt empowered to do whatever it took to meet customer needs and directly contribute to the L2R score. Their engagement level increased by 12%, and lower attrition drove down costs while increasing customer retention (see client impact 1). 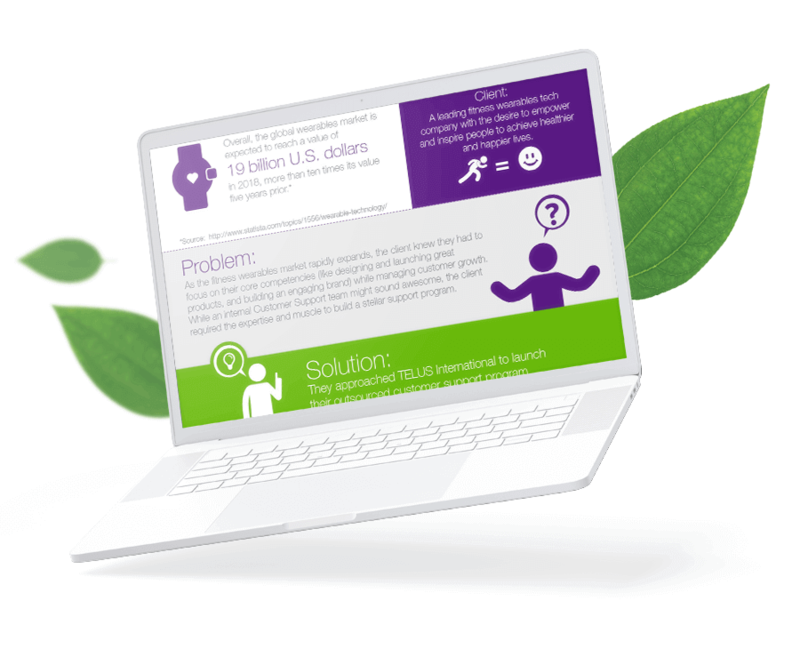 For one of our top clients in the connected fitness and health market, sustained growth over several years required us to create new strategies to raise our engagement level. So we asked team members for their input. The result? We deployed our Coaching for Excellence program, where team leaders mentor their team members one-on-one to drive sustained performance improvement over time. That, along with team-building events designed to help team members use the client’s product to build a healthier lifestyle, drove measured engagement from 66% to 75% in 2015 (see client impact 2). The Culture Value Chain proves that team member engagement drives top-line growth for companies like Apple and Zappos. 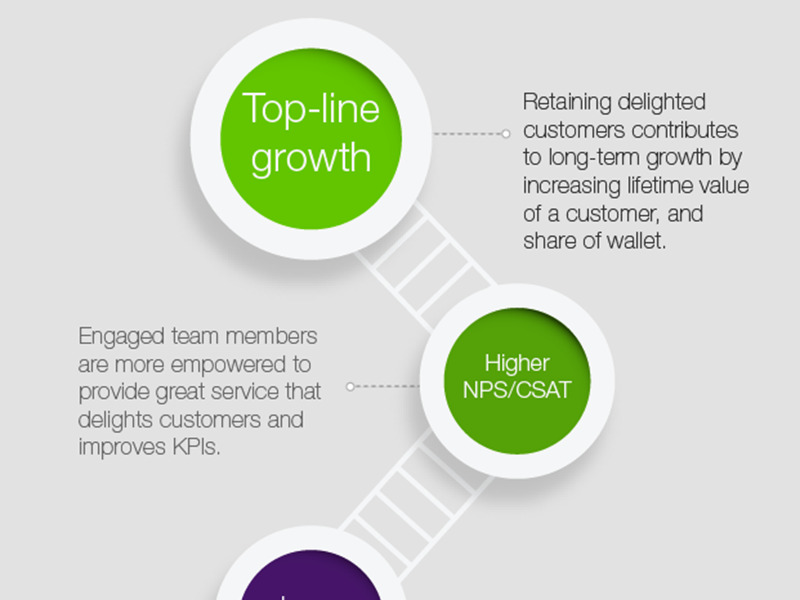 TELUS International has proven the same focus can be applied in an outsourced environment.